In the quest to help children develop the skills needed to start learning to write, this toy is a surprising win. Simple, Fun, and Great For Building Hand Strength! 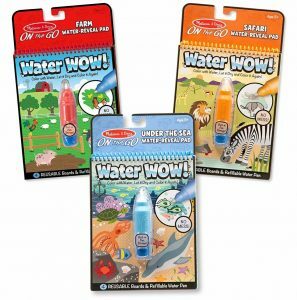 The Water WOW painting sets have little paint brushes you fill with water. 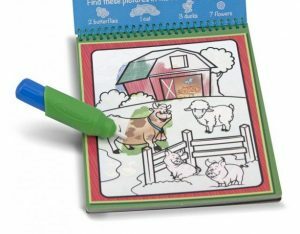 The child uses the brush to paint pages in the book and reveal colors, hidden objects, and animals. This means there is no mess and no writing on the walls with these! The paintbrushes are fat and easy to hold, so children who are still learning a proper grip can do the first steps towards a proper pencil grip. Learning to paint with the brush and not crush the bristles promotes learning to use the correct pressure when writing. Many children push down too hard or too lightly with their pencil. This is a great way to start learning to control their pressure. The thing I like best about this toy is that it appeals to kids who may not like coloring or painting because they get a beautiful result every time. The stress of creating the art is greatly reduced with this activity, letting the child just get the hang of holding the brush and applying the “paint” (which is really just water). The suggested age is 3+ but I’ve had great experiences with kids as old as 7 painting with these. Regardless of age, these toys encourage fine motor coordination, dexterity and hand strength for writing and coloring. They come in tons of themes, so you can choose one that suits your child’s interests. P.S. Here are the links to the Water WOW painting sets I’ve recommended today.